Vary the scale factor and rotation of an image and compare it to the preimage. Determine how the angle measures and side lengths of the two figures are related. This document could be used after doing the Prior Knowledge and Activity A in a Whole Group instruction f... (more)ormat. In this task, you will experiment with similar figures. Similar figures have the same shape, but are not ... (more)necessarily the same size. Retooled Guide leaves more room for students to write, changes some questions for higher studetns and has... (more) a section about scale factor and perimeter. Changed guide so it is more student friendly. Altered student worksheet to match change in lesson guide. Altered lesson presentation for differentiation and time. I took the Explore Learning and added lines and increased the font for the students to fill in as they wo... (more)rk through the gizmo. 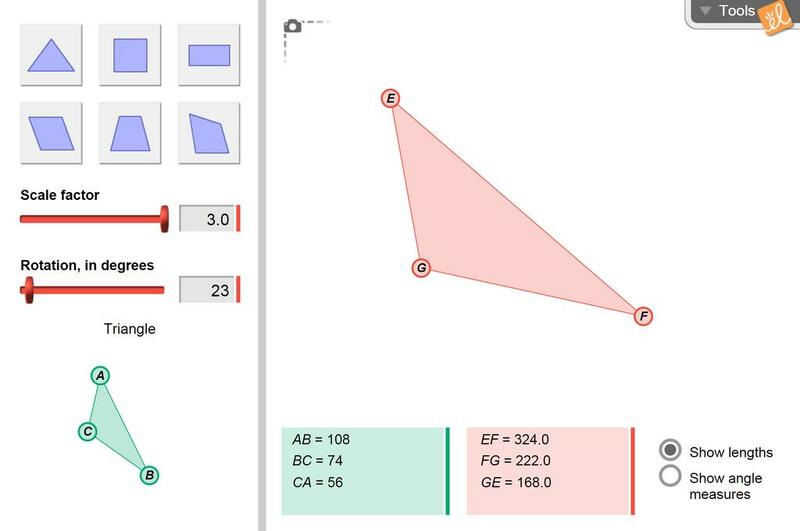 Great visual for seeing how the changes in one polygon affect the changes in the other.